Two common problem that seems to keep people from eating right is lack of time to prepare good food and cost. Well, there’s good news! Preparing healthy and delicious meals does not have to be expensive or time-consuming. I’m going to share with you three things you can use to save time and money when it comes to cooking and buying food. Let me tell you before I found these programs I can’t even tell you how much money (and food) I wasted every week! Shameful is the only word to describe my wasteful ways with food. It doesn’t help that I don’t like leftovers so rarely did I eat the leftover food I always stored each night. This is either because I cooked too much food, didn’t get to cook some food items before they went bad, or just from plain old failed to meal plan. It really bummed me out and I knew I had to fix this problem. Well, I found the solution and haven’t looked back since! These simple and easy solutions have been such a lifesaver for me. I’ve got my peace of mind back from trying to create a meal plan each week. Meal planning is a chore for me despite the fact that I do it every week. I’ve actually gotten pretty good at meal planning and have even managed to incorporate my meal planning process with the $5 Meal Plan. If you want to be like me and simplify your life, save money, and have more time for other things, then you should consider the following. The first program is the $5 Meal Plan. 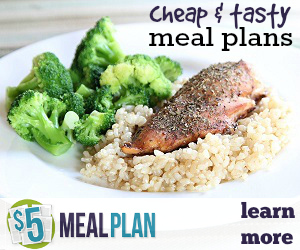 It’s a weekly meal plan service that will change your life! Well ok maybe not change your life, but certainly make it more enjoyable. $5 Meal Plan is a real game changer. The best part? You can choose between the Classic Plan & the Gluten-Free Plan! Yes! This is awesome for those needing (or just wanting) to go gluten-free. How it works is each week you get a meal plan and a shopping list. It will include 6 Dinner Meals, a Breakfast, a Lunch, a Snack and a Dessert (and occasionally a Side Dish or other tasty treat!) all together on the same plan. As the name suggests, each meal is designed to cost under $5. I don’t know about you, but I love everything about the New Year. I mean, what’s not to love about a fresh start after spending time with friends and family. I can think of one thing: getting back on track in the kitchen after the holidays. 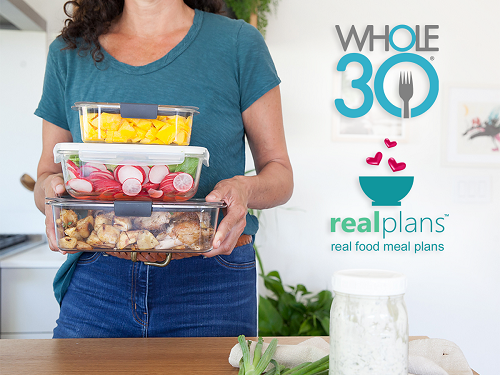 Before the holiday deliciousness threatens to derail 2018 for you, I want to share this great opportunity from Real Plans. This helpful resource can turn healthy eating into a stress-free and enjoyable activity. Trust me, you’re going to want to get in on this meal planner that does all the work for you. The best part is that they cater to everyone! You can get access to all types of meal plans including traditional, gluten-free, dairy-free, GAPS, Paleo, Keto, and Vegetarians options. As Real Plans states: “Real Plans is a meal planner with super powers” I have to agree. It creates a custom plan that caters to your family size, needs, and schedule. What you get is a personalized weekly meal plan. 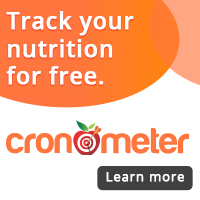 It includes an automatic shopping list, nutritional data, and a recipe importer. You can import your own recipes and change out any ingredient you like to subscription recipes as well. Nutritional Data is also included. I could go on and on about all the features of this program but you’ll just have to check it out yourself to see what I’m talking about. Here’s a short video if you want to learn more. Have you heard of the app Ibotta? 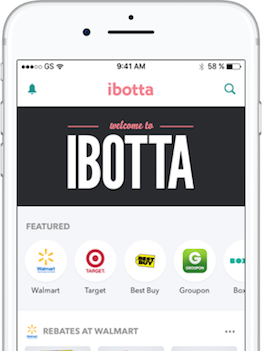 Ibotta is a money saving app for grocery shoppers. There are 238 stores that support Ibotta. 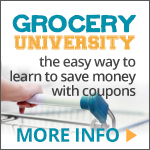 Some of those stores include Walmart, Kroger, and CVS Pharmacy just to name a few. To get your cash back, all you have to do is scan the items’ barcode, take a photo of your receipt, and the money goes into your account within 48 hours. Send Receipt allows you to earn by adding offers on products by completing simple tasks before you shop. Go buy the products you selected at participating stores. Take a photo of your receipt to redeem your offers and within 48 hours your cash back will be deposited into your account. Easy Peasy! Connect your loyalty card or phone number to one of Ibotta’s Preferred Partners. Add offers on products by completing tasks before you shop. Use your loyalty card or phone number at check out. Find your cash back offers from top apps. Before you shop, tap the shop button from Ibotta app. Make a qualifying purchase in a participating app. That’s it. If you want to earn even more consider signing up for Teamwork using your Facebook account. The more friends on your team, the more bonuses you earn. You can get extra cash back with bonuses when you buy featured products, redeem items at specific retailers, or complete certain tasks. Finally, when 10 friends sign up with your referral code and redeem a qualifying offer, you’ll earn $100. $20 or 2 friends, and so on. This offer is through January 31 so to take advantage of this deal you’ll have to act fast. The friend sign-up offers vary. 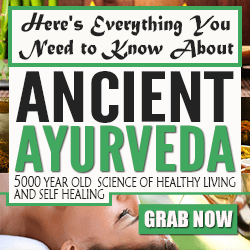 Give it a try and watch your life become more manageable and less time-consuming. Have you all heard of Thrive Market? It has your favorite organic and non-gmo brands for up to 50% off retail! Paleo, Gluten-free, Vegan, Non-GMO, Organic, Raw. I can’t tell you how much time purchasing from this site has saved me. We all want to eat healthier. My purchases from Thrive (especially their healthy snacks for when I’m on the go), have helped me to eat healthier when I’m starving but don’t have time to eat at that moment.